The school year is coming to an end. Only two and a half days left! B had a great idea for teacher gifts this year. She wanted to make BIG cookies for the teachers. We spent some time Saturday making up a double batch of Snickerdoodles, a double batch of Chocolate Brownie Cookies with white and chocolate chips, and a triple batch of Ultimate Chocolate Cookies with the fun addition of Skor bits. On Sunday we baked everything. These are really big cookies. We used 1/3 of a cup of dough for each cookie and due to the differences in the doughs, they range from 4 to 5 inches in diameter. 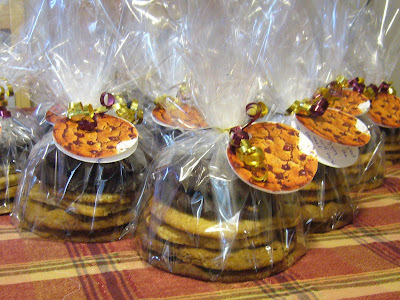 Here they are all ready to be brought to the school; 14 pretty packs, 84 big cookies! that's so thoughtful of you and B! what a great idea.